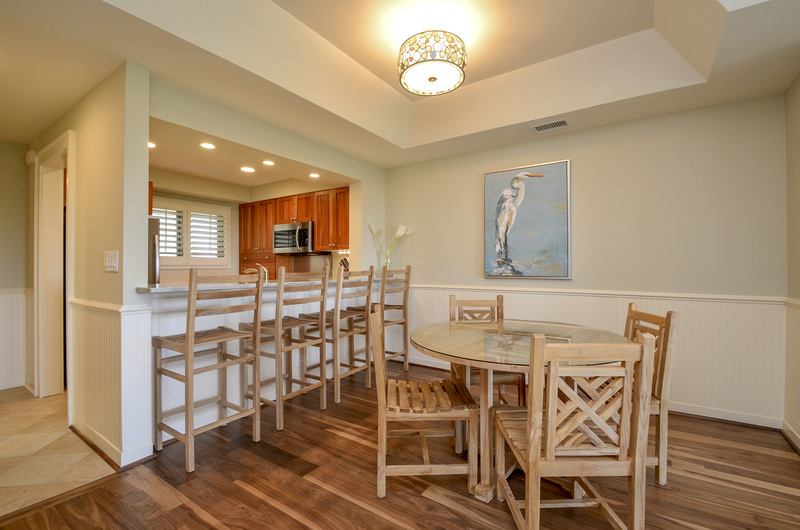 This lovely 4th floor, 2 bedroom Kiawah Island oceanfront vacation rental, located at 5130 Windswept Villa, underwent a complete renovation in Spring 2015. 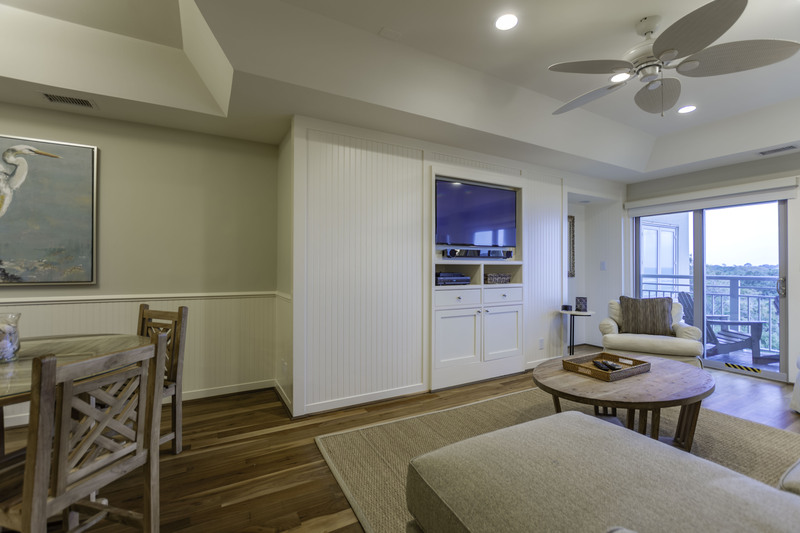 The main living space features an open kitchen, dining, and living area, which opens to the covered deck with ocean views. 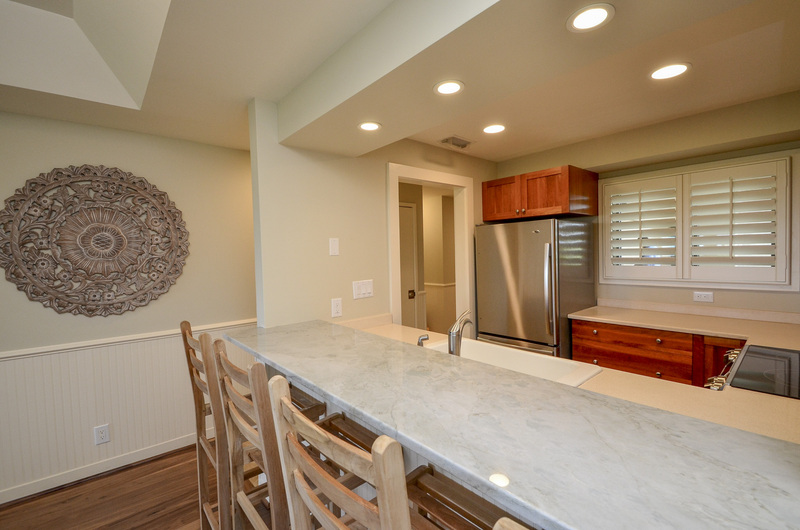 The fully equipped kitchen offers plenty of space for preparing your vacation meals. The kitchen bar and dining table each comfortably seat four people. 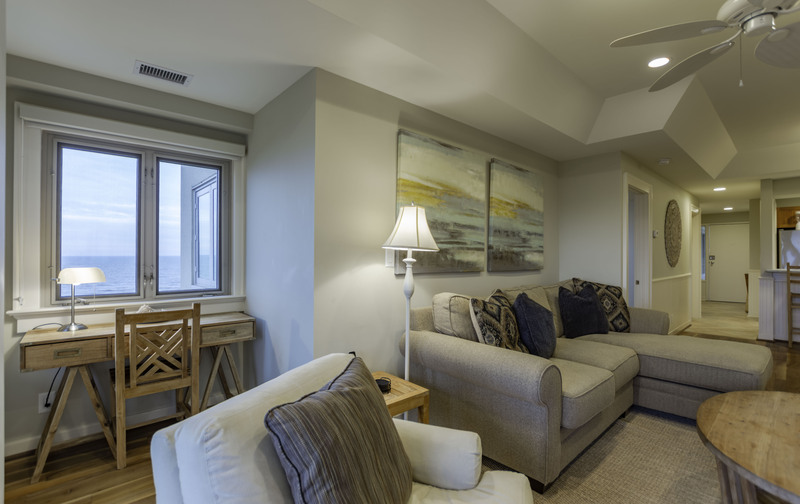 The living area features a large sofa, two cozy side chairs, and a large Smart TV with DVR, Blu-Ray, and sound bar with Bluetooth wireless music streaming. 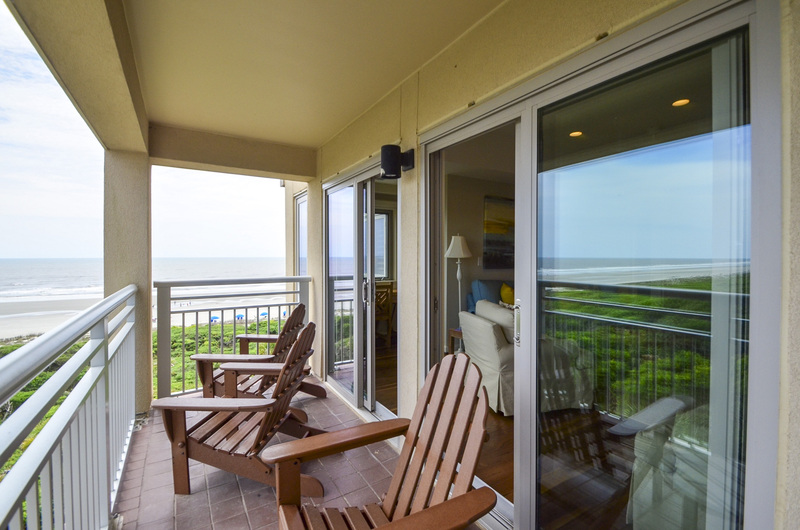 The covered deck is perfect for relaxing and enjoying the Kiawah beach and ocean views. 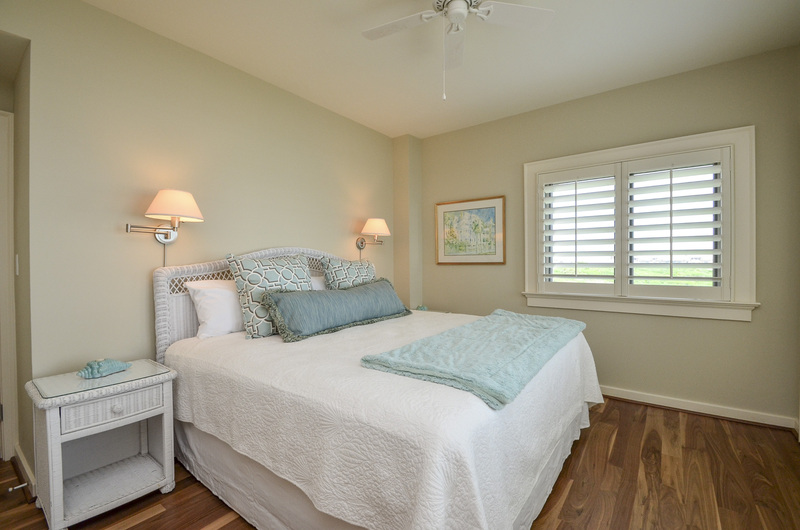 The oceanfront master suite offers a king bed and private bathroom with large tiled shower. 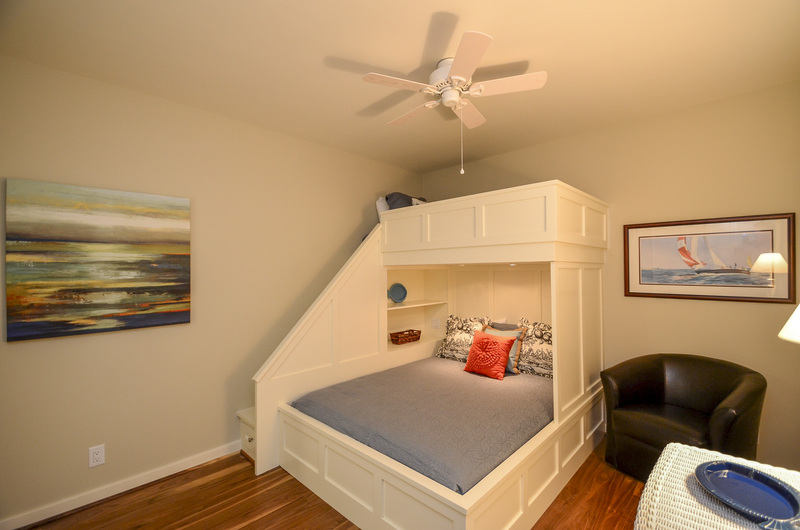 The second bedroom features a twin over queen bunk bed, side chair, and bathroom with a bathtub/shower combination. Both bedrooms feature flat-screen TVs with HD channels. The villa is furnished with washer, dryer, and high speed wireless internet. We have vacationed to Kiawah at the end of September for the past 5 years. We stayed in several of the Windswept Villas but this is the first time we have returned to a second year. Great location. We intend to return next year. We have stayed in many condos rented through Akers Ellis and this one was one of our favorites. great place, great location and great service provided by management company service. 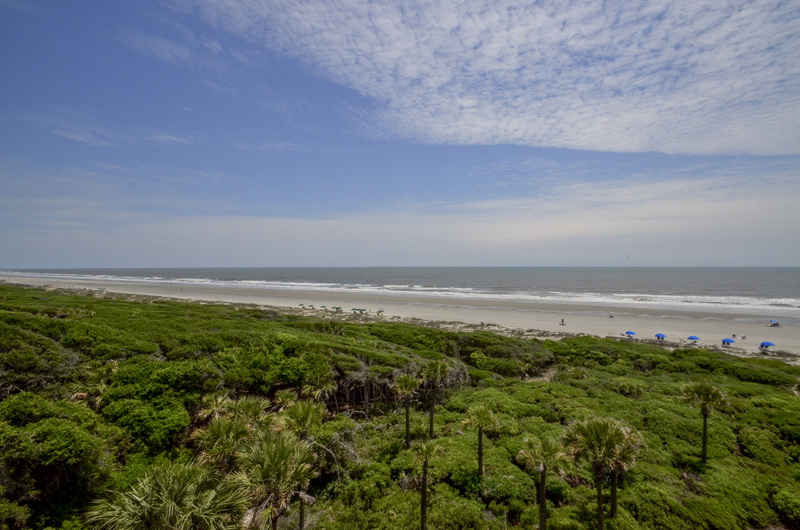 This property is very central to all the activities on Kiawah Island. Parking is easy and elevator access is convenient. We did several self-guided tours and rented bicycles to ride on the beach and local streets. Groceries and Restaurants and plentiful and very good in Freshfields Village and Bohicket Marina. We spent a couple of days in Charleston (about 45 minutes away) with many of the activities there. If you plan on cooking as we did, the kitchen is adequate, but sparsely equipped. Bring all your own condiments. All-in-all a very comfortable Villa in a very convenient location. Hi David, Thank you for the review. We would be happy to take a look at the kitchen and add any needed items. Thanks for letting us know. We are so pleased you enjoyed your stay! We really enjoyed this unit. we stayed for two weeks. we had four adults and one child. The ocean view was great. The unit was comfortable and accommodated our group well. Everything in the unit worked well. This place did not disappoint. Amenities were very nice and updated. Loved the chairs on the deck and furnishings. My only suggestion would be to have a few beach chairs available for guests as we weren't able to bring our own due to limited car space and had to incur an additional expense of renting for the week. My wife and I had a really great time! The room was clean and well maintained/updated. It was a very enjoyable anniversary vacation. Hi Eric, Thanks for your feedback! We would be happy to take a look at the mattress. Please let us know when you would like to return. We would love to host your stay again! 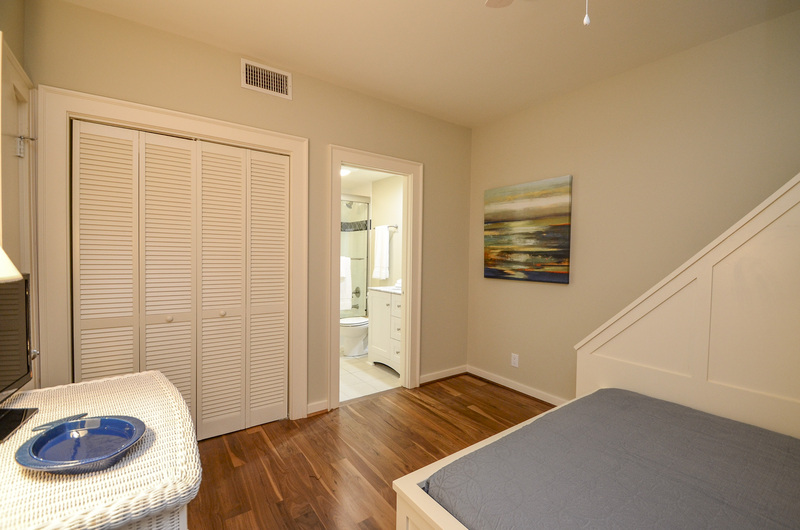 This unit was perfect for our week at Kiawah. 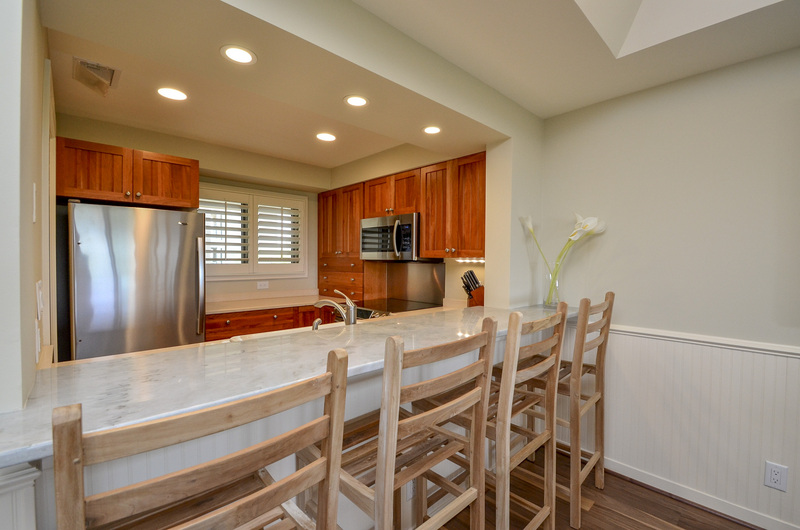 Super clean and bright, with contemporary furnishings. Fantastic view! Also loved the easy access to the beach and to Heron Park. My son was able to easily ride his bicycle to the basketball courts every day. We really liked this unit and will plan to stay there again. 5/5. We very much enjoyed our stay. The condo is beautiful- especially with the upgrades from last year. The only suggestion I have is related to your app - previously you sent the code to enter the unit via the app. This was very convenient. Thanks. Thank you. We had a wonderful time and would put our experience at a 5. We were extremely happy with our rental and Akers. I was very impressed with the Akers and Ellis App. It was handy and efficient. Will defiantly be using Akers Ellis in the future! 5 Stars!!!! 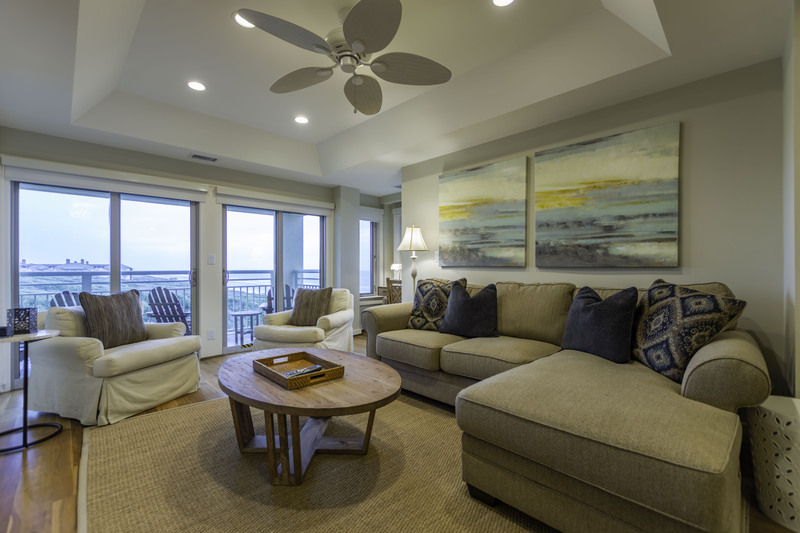 We have rented from Akers Ellis for 2 years now and have been coming to Kiawah Island annually for 17 years. The past two years that we rented from Akers has been our best experience. Loved the property and the view was wonderful! We have been coming to Kiawah for over 30 years, but this was our first time using Akers Ellis. Everything was good on our end and our stay was wonderful. I loved the ability to do the "mobile check-out" and mentioned that the front door was very hard to open but that was the only issue. We enjoyed out Kiawah stay very much. The 5130 Villa was an absolute dream - light, bright and everything we needed. Working with your team was also seamless and professional. We will certainly consider using Akers Ellis again - if we are able to return to Kiawah next year. We had a great trip. Thank you. A beautiful condo and location. We really loved having a lock box and not an office to go to! We had a very nice time and really did love the condo. Great week, comfortable beds, quality appliances, a pleasure to stay there! 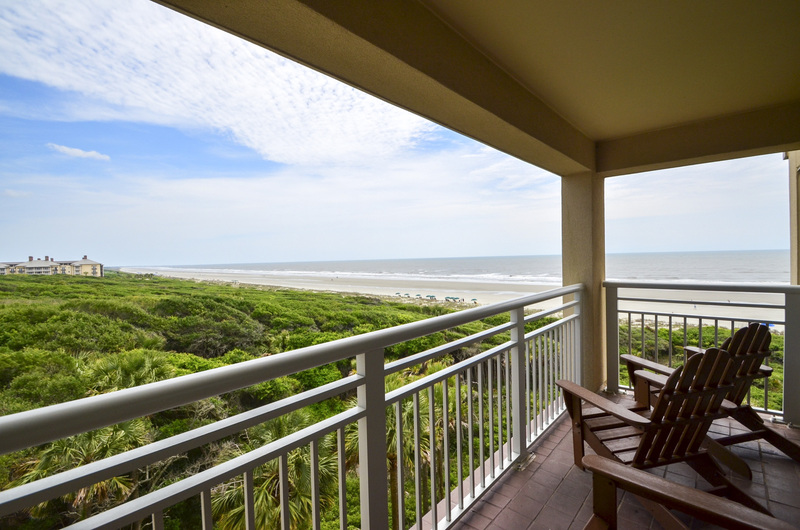 Kiawah is a great family vacation place and this unit is as close as you can get. The property was in good condition and reflected the pictures and descriptions online. Rental process was smooth and easy. The Akers app was great and we went straight to the unit without needing to check in or out with the real estate office. The beach was terrific and we enjoyed riding bikes on the beach and paths on the island. Definitely recommend renting bikes for your stay. Golf at the Ocean course, while expensive, is a great golf experience. Charlestown is an easy 40 minute drive and a terrific city for walking around and for dining. Nice condo in a convenient location. We will visit again. Love the Condo, Love the views from our condo, never a problem getting a parking spot or using the elevators. The only downside was we couldn't use our lovely balcony for the whole week because it was love bug season and the porches are not closed in like most condos we rent on the Island. we had great weather, the condo was a substitute from Akers Ellis because of rain damage to our original rental (thanks to the Akers team). Everything was in good shape, but storm damage closed the beach access except for some adventurous ones like us. Accommodations were fine, view was fabulous. Wonderful unit with stunning views of the ocean. Not listed in the description from what we could find was the full wall of windows in the master bedroom facing the ocean. We loved being able to listen at night to the sounds of the ocean as we fell asleep and then to wake up and see the ocean first thing. Everything was perfect with one exception. The beds need to be replaced with more comfortable ones. Thanks! A perfect spot to enjoy ocean views, sounds, breezes...beautiful views across a natural wooded area as well, with Sanctuary in distance. 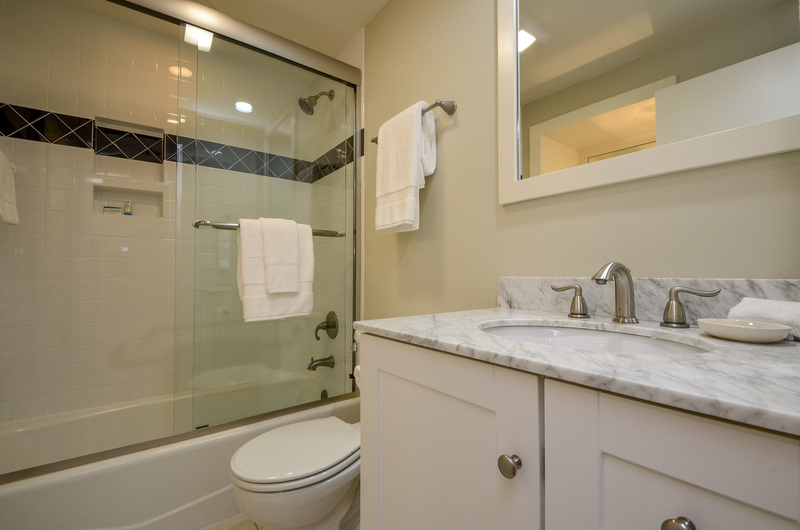 Well-appointed kitchen and two baths, two bedrooms...great for a family with two kids. Dad and Mom get to enjoy sunrise views from bed! Short walk to Night Heron Park and nature center, with bike rentals. Rent DVDs at local RedBoxes for use in BluRay player in living room. Cute decor. Happy, cozy place for private winter getaway! We enjoyed our vacation and overall had a great time. We thoroughly enjoyed our visit to Kiawah and Windswept villas. I would definitely rate the stay a 5! We will be back! The fresh appearance and cleanliness of the villa were impressive. The furnishings were in good condition and sufficient for four occupants. Overall, we were very pleased with the accommodations. This is our second stay at this property and really enjoyed it again. Great location and nice amenities. We enjoyed our stay at Windswept Villas. The condo was conveniently located to our tennis tournament and within walking distance to The Ocean Room where we enjoyed several meals. I would give high marks. Thank you again and hopefully we will return next year. All in all, a great weekend. Will definitely use Akers Ellis again. We were satisfied with our overall experience. Everything was great with 5130 and everything went very smoothly. Overall satisfaction was a 5 (except for the weather, but we won't hold you responsible for that). Thanks for everything. Our stay was very nice. The check-in application was great (printed gate pass, key code). The key box was very convenient. 5130's view was stunning! The decor could use some updating — some simple changes would go a long way. Thanks for helping us find a place for the week! Our vacation experience at Kiawah was excellent so we were very satisfied. You & your team did a great job and the condo was exactly what we were looking for. We were sad to leave this wonderful place. The views and location were perfect. The villa was clean, comfortable and well equipped. Akers Ellis staff was helpful and accommodating. Their app was very easy to use and provided useful information. We look forward to returning to Kiawah Island again next year!Thank you. I would rate the stay as a 5++++. We have stayed on Kiawah in the past, but did not use Akers Ellis for the accommodations, which is regretful. From the initial online search and phone calls, to the cleanliness of the villa and easy check in/out procedures, the entire experience was above expectations. We have kept the information for your company and we will definitely be repeat loyal clients!